Bring the best of fresh designer ambiance to a bedroom or living space with this framed rectangular wall mirror. A product of Gatco, its clean lines and rounded mounting brackets present a tasteful contrast that works perfectly in an updated setting. A reflective glass pane with beveled edges lends a tiered look for style and sophistication, and shines in a metal construction frame with a chrome finish. This framed rectangular wall mirror offers the charming bonus of silken escutcheon plating. 24 1/2" wide x 25" high x 2 1/4" deep. Hang weight is 14.35 lbs. Glass only section is 20 1/2" wide x 24" high x 1" deep. Surrounding frame is 1/2" wide. 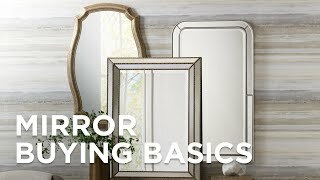 Framed rectangular wall mirror from Designer II collection by Gatco. Chrome finish. Metal frame construction. Beveled mirror glass. Accent an updated boudoir or living space with this tastefully designed framed rectangular wall mirror.